Our ever-popular Puto Bumbong Pancakes with our latest creation, the Butterbeer Pancake – a must try for all Potter-heads out there! Celebrate your Christmas with us, book your parties and get-togethers early, email info@earlybirdbreakfastclub.com. It’s a uniquely Filipino experience to start celebrating Christmas once the Ber months hit. The rest of the world waits the whole year for December 25 but here, we’re all a little nicer, all a little lighter and all a little bit more jolly when September comes in. At Early Bird, we’re held captive by that same merry spirit, rolling out our much awaited signature Christmas dishes that people look forward to all year long. 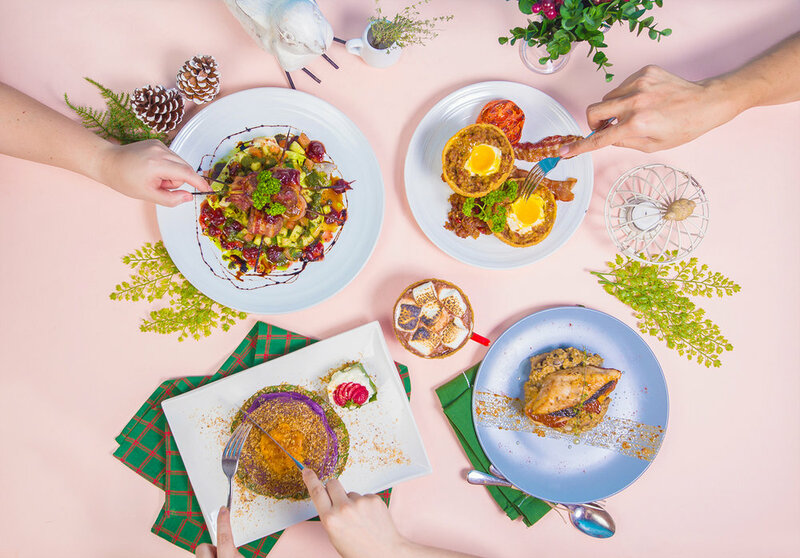 Our bestsellers are back, such as the popular and festive Early Bird Puto Bumbong Pancakes, along with our savoury seasonal favourites Bacon & Pineapple Scotch Eggs, Cranberry Piglets and Stuffed Chicken with Ris-OAT-oh! We also have a new addition to our hearty Christmas feast – Butterbeer Pancakes, a must try for any Hogwarts fan with a sweet tooth! We truly feel the season is upon us when we have good food to enjoy with family and friends. Come over and spend your Christmas get-togethers at Early Bird, with these dishes that can only be enjoyed at this time of the year. Because good food is meant to be shared with all and felt in both our hearts and our tummies – which is exactly how one should enjoy Christmas. Our Love Affair with Adobo Sunrise. Early Bird Breakfast Club © 2018 • Beautiful Breakfast. Morning, Noon & Night.